When talking business apps on mobile devices, task management/to-do lists is one of the top categories in my mind. There are few types of apps better suited for mobile devices. As a freelancer and consultant managing my time and tasks has always been a challenge. That’s why I am eager to try new apps especially when they set themselves apart with a unique feature. Today I’m looking at Zime (formerly GoodJob). 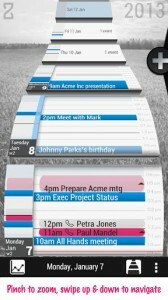 Zime, which is in Beta, bills itself as “your personal time organizer”. That’s a pretty big claim and I’m curious to see if it lives up to that statement. Schedule Tasks And Meetings: Schedule all your meetings, all-day events and tasks in one place. Just tap the screen and create a new event or task. Give it a title and you’re done! Sync with All Your Calendars: Zime syncs with all your existing calendars, so you can truly manage all aspects of your time on your mobile device. See Future Tasks: Just set the right start date and Zime will only display the task when appropriate. Prioritize Your Tasks: You can finely control how tasks are prioritized: re-order your tasks by simple drag & drop or set a deadline or a fixed time for your tasks. Dynamic Scheduling: Your tasks float and are automatically slotted whenever there is time available. Once completed, your tasks simply disappear and give space to other commitments. 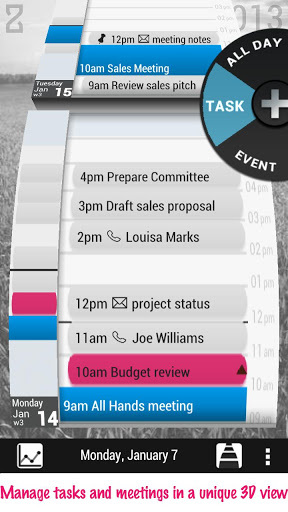 All In One Time Line View: With Zime you view and edit your meetings and tasks all in one view. No need to go through countless forms. Just tap your timeline to create a new event or task, give it a title and adjust its duration. Reminders: You can set reminders for your meetings and fixed tasks to get an alarm notification before your important commitments. Furthermore, Zime dynamically highlights your urgent or late tasks so you can see what’s important. Intuitive and Simple: Zime is all about simplicity and efficiency. Options are limited to the very basic to make it quicker and easier to play with. Set Deadlines: Zime automatically highlights your urgent tasks. Zime even anticipates which tasks are late and change their color automatically, so you won’t miss them. Take Immediate Actions: Just enter «call» in the task you create and select your contact… you can now launch the call in just one click from your timeline. Equally, Zime shows your itinerary when you click on your next meeting’s location. Plan Your Time: Zime lets you set your goals very easily so you can organize and plan your time effectively. All your tasks and meetings are captured in one place. See What’s Ahead: Zime helps you prioritize and focus on what’s important. The 3D timeline shows you in one view what’s ahead of you. As you progress through your work, Zime automatically re-arranges tasks as you complete them. Debrief: Zime allows you to debrief your previous weeks. In a few swipes, you can review how you did recently and rate yourself. By becoming more aware of your achievements, you will naturally become more effective. Take Control: Plan, Do, Debrief: as you repeat this positive cycle with Zime, you will soon gain further control over your time. 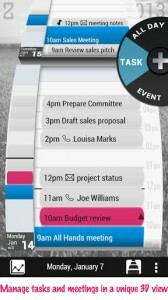 The first thing that you notice is the 3D Timeline which allows you to quickly find a day or task. You can zoom in…zoom out…move forward or backward quickly and efficiently. At first I thought the 3D Timeline in Zime was a gimmick and I honestly didn’t see the value of it. But the more I used it I quickly saw how much time it saved me. I was able to see visually where my time was free and quickly locate upcoming events/tasks/appointments. The ability to zoom out and scan the upcoming months in Zime is extremely fast compared to the traditional calendar where you have to move month to month. The settings for Zime allow you to set your work days, work hours, and the hours for your lunch break. I first didn’t understand the purpose of this until I created my first task. When you create a task you can make it fixed or floating. Floating lets Zime determine the best time to schedule it. 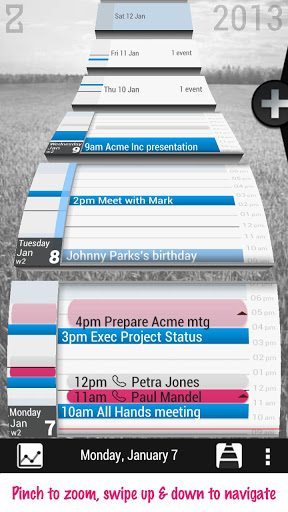 Zime looks at your current calendar and finds a time to fit in the event/task. This is a nice little feature that is particularly useful for tasks more than events. Another nice feature is the Task Priority feature. This brings up a list of upcoming tasks which you can prioritize by dragging them. This changes your schedule for the events by placing the most important events first on your calendar. I found this feature by poking around and was very excited…I love it and I think it pushes the app to the next level for me. I can see myself opening Zime and looking at my tasks and deciding day to day what should be my top priorities. 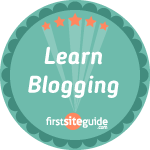 This can certainly help freelancers or consultants who have many clients. Sometimes your priority changes based on who called with a request last. Zime has an interesting feature which lets you tell it whether you were on time with your tasks and assigns a percentage score for the week. It then plots your past weeks on a line graph. This shows you how you have performed over the past few weeks/months. This was interesting, but I’m not sure of how I would use this other than to be curious. I’m sure there are those out there who like to track and stat everything and they would love this feature. Zime is an app that is a shock to the senses at first. It doesn’t seem to fit with what you think a task management/calendar app should look like. But as you actually begin using the app it grows on you. It aims to help you complete your tasks and become more efficient. If you use Zime to it’s full potential then that is certainly possible. I honestly didn’t think I would like the app but Zime has made it’s way to my home screen on my Galaxy S3 and it will be staying there. The app is free so give it a try.